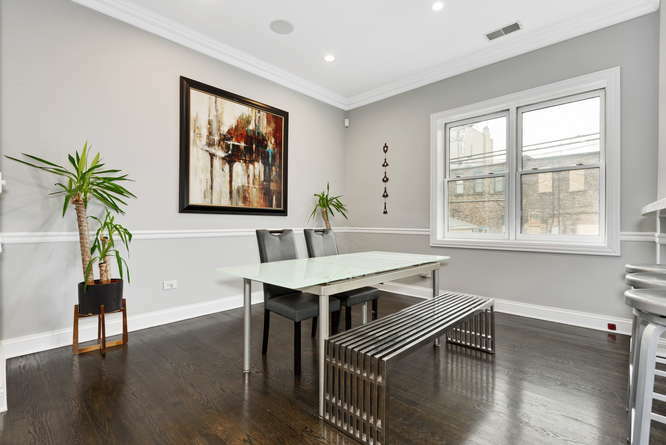 Welcome home to this Bucktown completely rehabbed and updated, move-in ready, extra wide duplex. 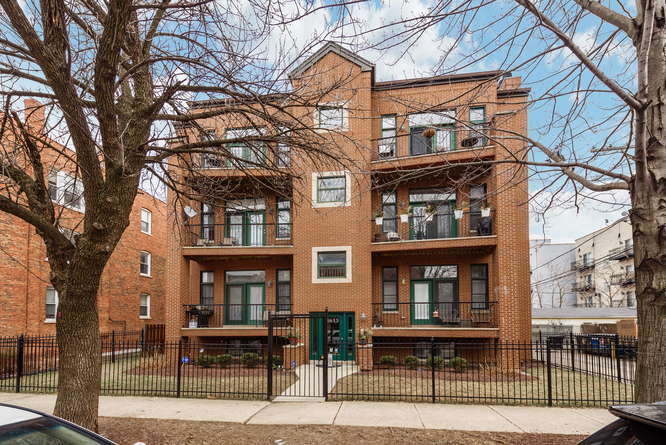 3 bedrooms, 2.5 baths with 2 outdoor spaces and a garage. Parking is included in the price! 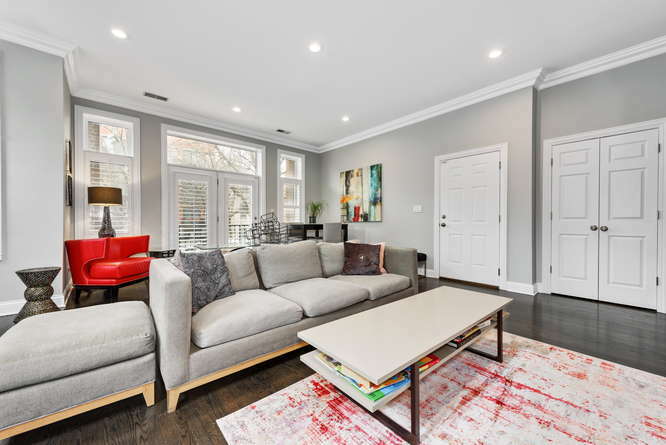 As you enter this extra wide living area you’ll feel right at home with the fireplace, 10 foot ceilings, crown molding and hardwood floors throughout the main level. You’ll appreciate the large balcony just outside of the living area. 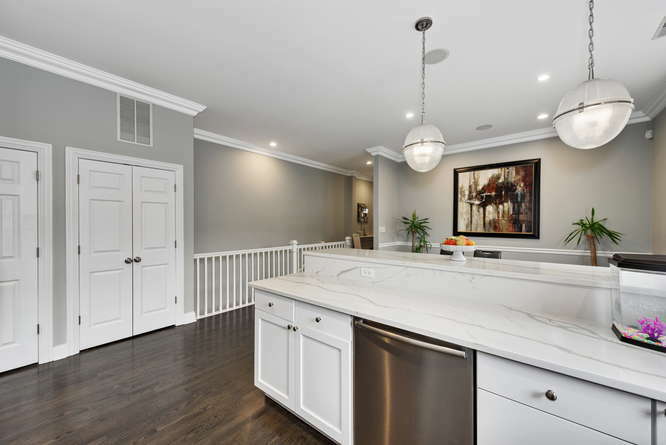 The completely updated kitchen will make you the envy of all your family and friends. 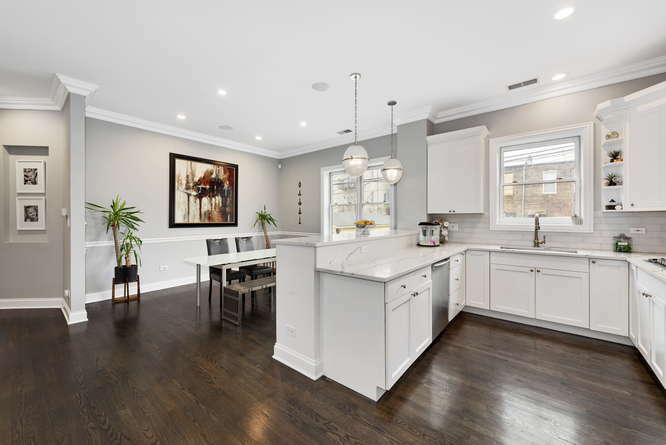 42″ white cabinetry, quartz counters, stainless appliances and a breakfast bar make this kitchen great for entertaining. 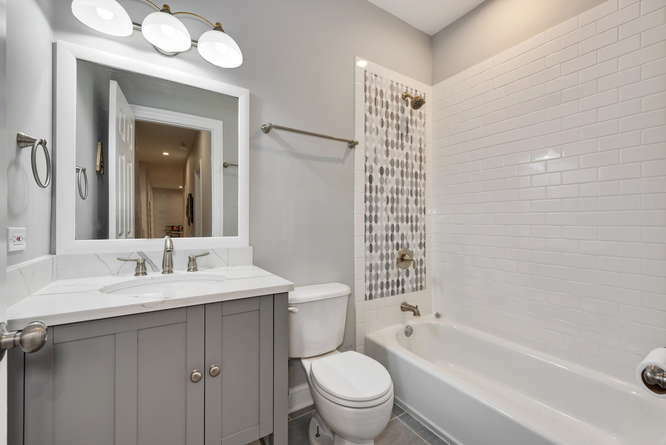 Step into your cozy master suite that is highlighted by the beautiful updates that include new tile and a walk-in shower. 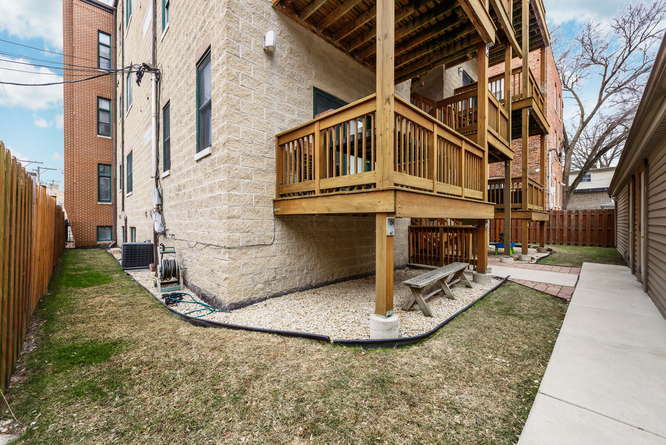 Enjoy a glass of wine on your deck located just outside of the master. 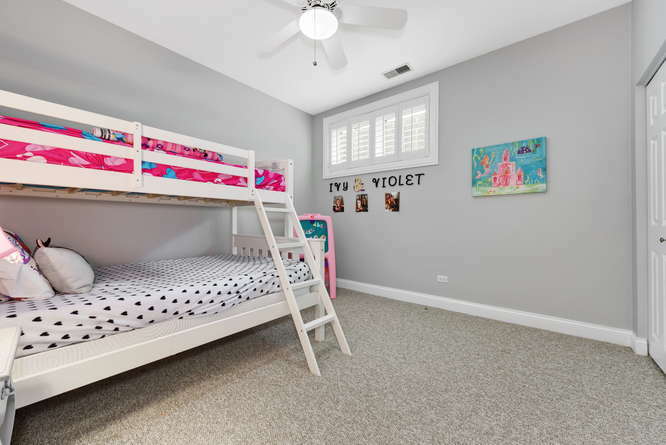 Family room is a spacious 22 x 22 w/9′ ceilings. 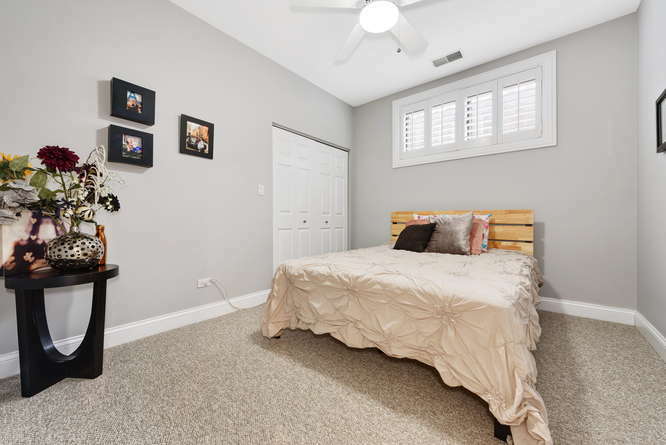 2 large bedrooms and a full bath make this a great space for your family and visitors. Balcony located right off of your large living room. Welcome home. Step in to the large living room. 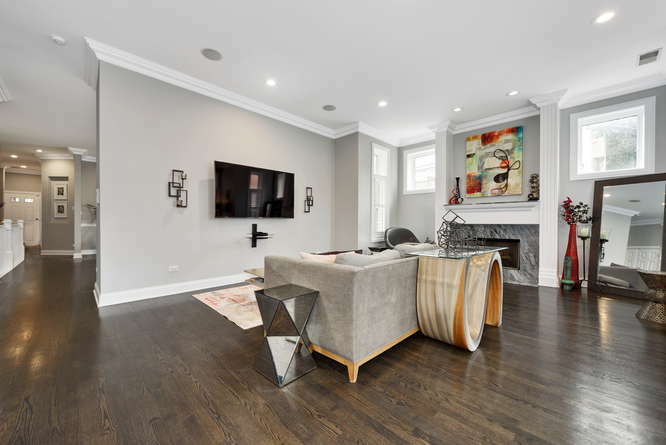 The fireplace is a nice feature in this room Crown molding with darker stained hardwood floors throughout the first level. The sleek sofa faces the wall-mounted television. The generous size of the room allows for entertaining or a relaxing night at home. 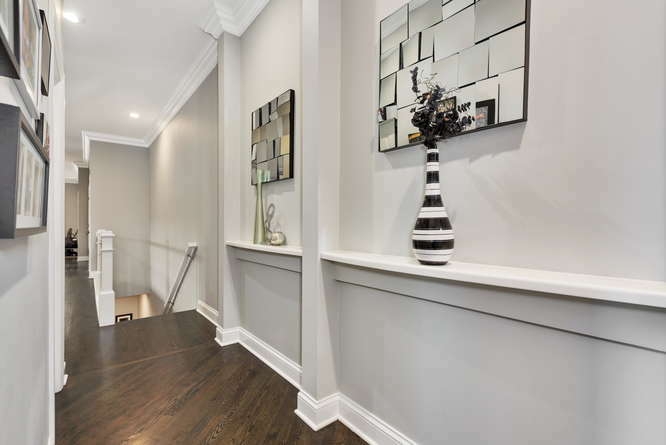 10′ ceilings along with crown molding and numerous windows will welcome your guests as they enter your home. 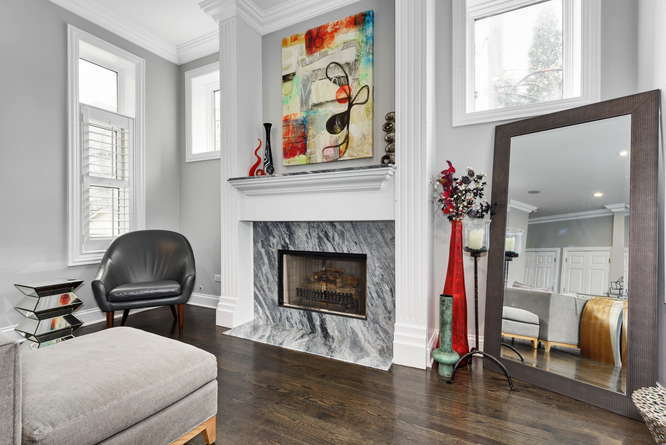 Beautifully updated fireplace with a sleek contemporary marble surround. The large French doors along with the floor to ceiling windows will make this a perfect area for your morning coffee. 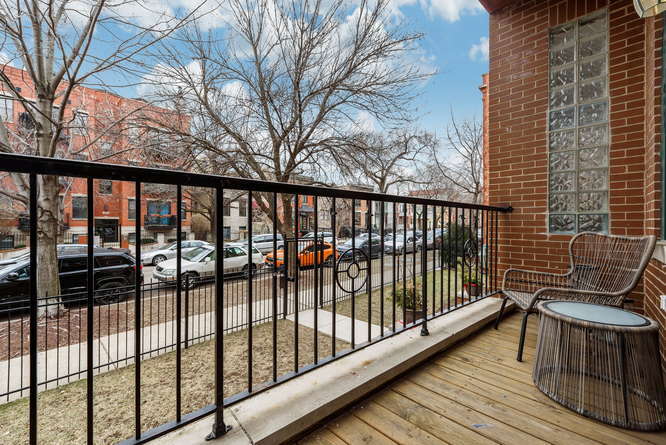 Step out the French doors and sit on your balcony. 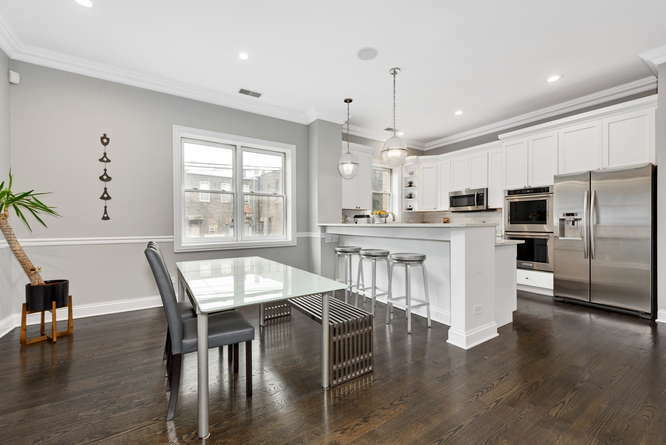 Completely updated kitchen with 42″ cabinets that have been topped off with crown molding, quartz countertops, and contemporary lighting. 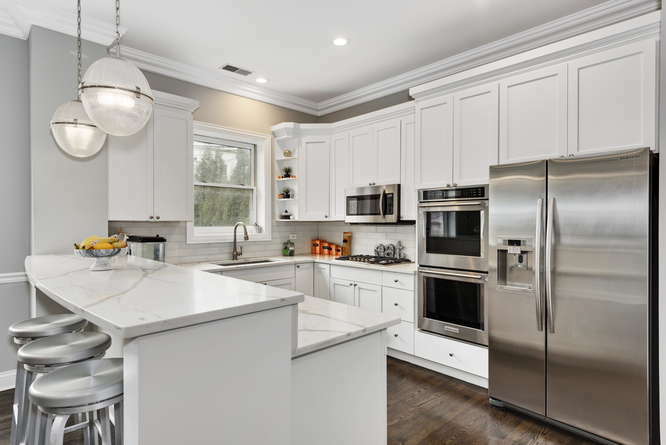 Stainless appliances, with a built-in double oven will make you the envy of friends and family. 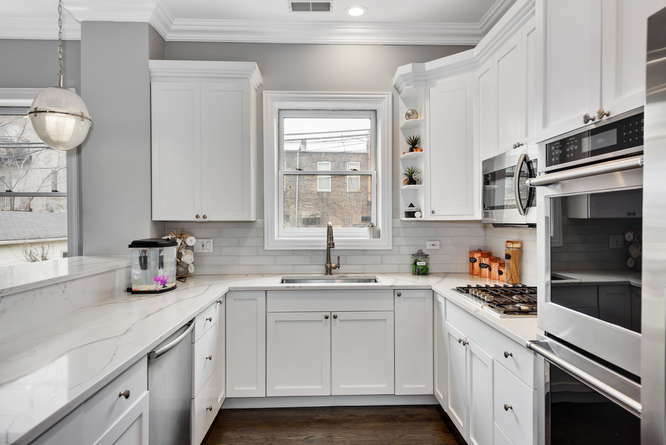 The sleek white cabinets along with the cool white quartz countertops are a few of the many upgrades in this kitchen. The large breakfast/peninsula will allow you to enjoy a casual meal here. 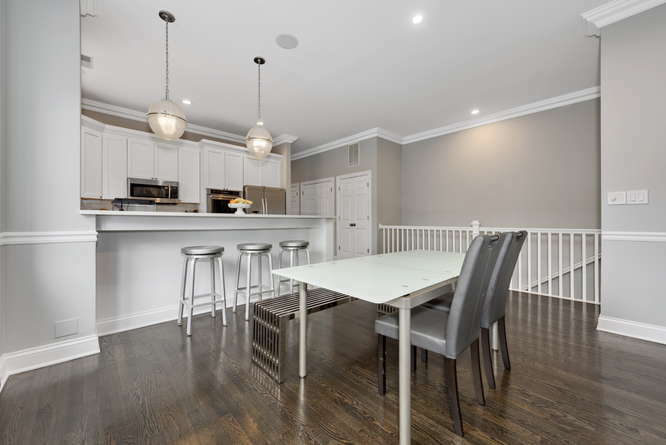 The luxurious kitchen and dining area is great for entertaining. 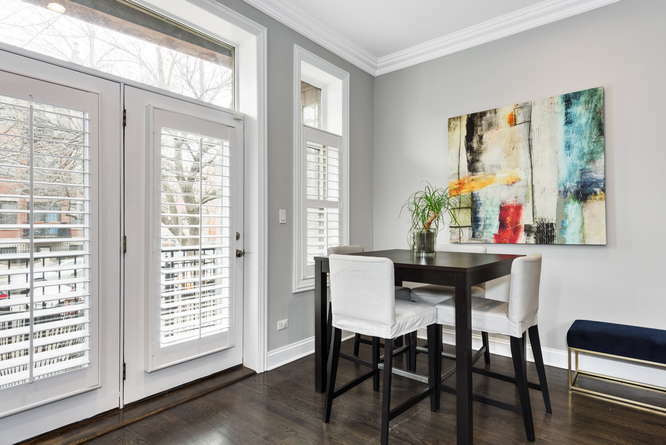 10′ foot ceiling, crown molding and a large window to allow sunlight to stream. 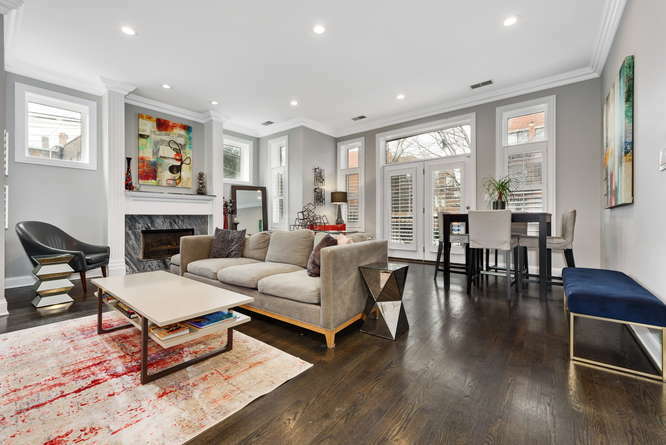 You’ll notice the updated lighting, crown moldings and darker stained hardwood floors throughout the home. Darker stained hardwood floors, large windows and French doors that lead to the deck located right outside your luxurious master suite. Luxury at its best. 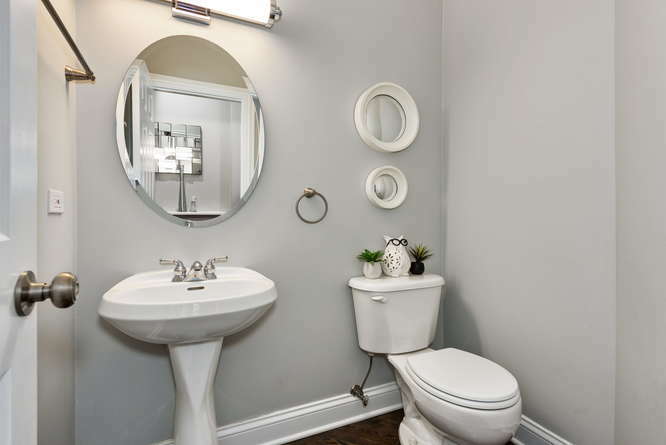 Double sinks, heated floors, along with contemporary lighting. 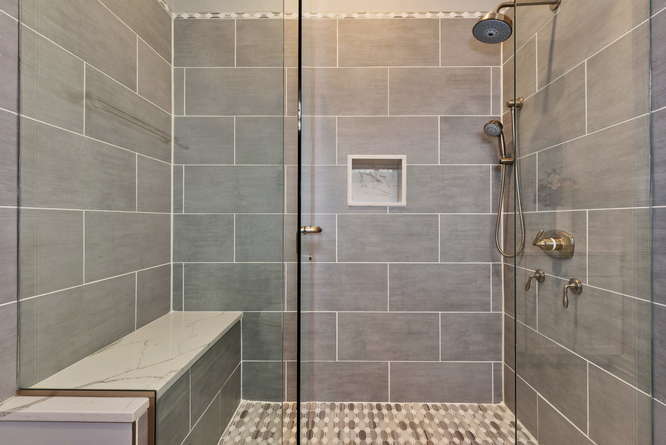 Luxurious walk in shower with a bench. Conveniently located on the first floor. Notice the details in this home. Crown molding and woodwork throughout. 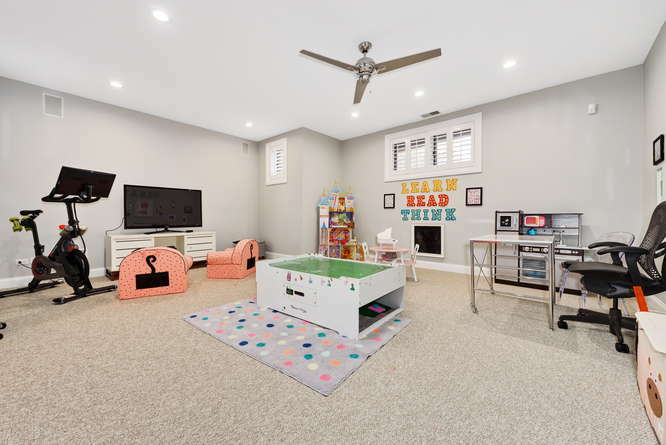 Massive lower level family room with 9′ ceilings and large windows throughout. 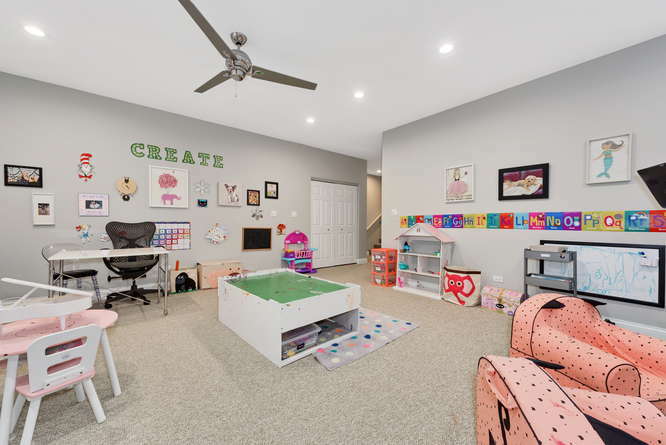 Currently being used as a playroom but large enough for your sectional sofa, table set, game tables or a pool table. Great space for entertaining and relaxing. Large 2nd bedroom. Currently being used as a children’s room with a very large wall closet. Nice size guest bedroom. Can be used for your family or your guests. 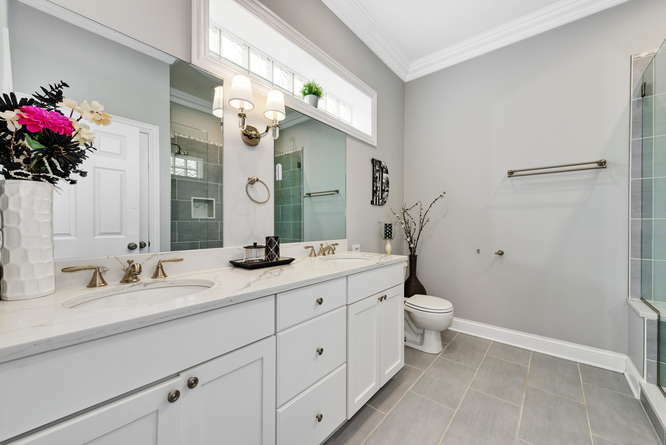 Beautifully updated full bath with contemporary tiles. Large deck located on the back of the home, right outside of your master suite.